Welcome to our website. Please see our Welcome Message . The Los Angeles Science Fantasy Society , founded October 27, 1934, is this world's oldest continuously-active science-fiction and fantasy club. Come in any Thursday at 8 PM to our weekly meeting. Visitors and prospective members are always welcome. Click Visitors to learn about membership fee and dues. Ask someone to point out the Registrar, who will ask you to fill out a guest card . Brief schedule : see Upcoming Events. LASFS meets in Freehafer Hall , currently located in the Friendship Hall of the American Lutheran Church, 747 N Whitnall Hwy, Burbank 91505 -- near the intersection of Clark Ave and Hollywood Way (between Magnolia Blvd and Verdugo Ave). There is plenty of street parking and a parking lot behind the church (enter from Screenland Dr). People begin to show up for LASFS meetings at 6:30 PM. The meeting starts around 8 PM. San Francisco Beat, number 27 in "The Emperor's Secret Files" series, is now available on Amazon in Kindle edition. Four detective stories set in the BArea, with science-fictional elements and exciting action. 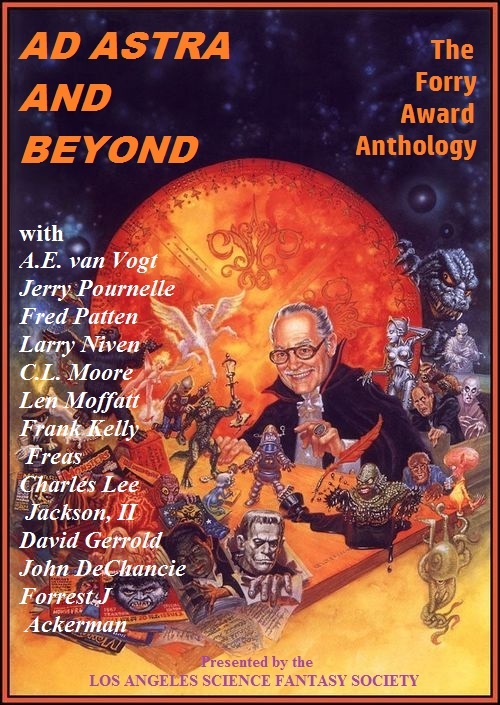 LASFS's First Digital Publication : LASFS has made available on amazon.com an anthology publication, Ad Astra and Beyond : The Forry Award Anthology , containing contributions by Forry Ackerman, John DeChancie, David Gerrold, Charles Lee Jackson, II, Frank Kelly Freas, Len Moffatt, CL Moore, Larry Niven, Fred Patten, Jerry Pournelle, and AE van Vogt, all laureates of the Forrest J Ackerman Award for lifetime service to science fiction. The LASFS meeting begins around 8:00 PM, every Thursday night, but there's usually something going on before then. Visitors may attend three free meetings. After that, we'll decide they must like it here and ask them to fill out a membership form and pay a $10 membership fee . O nce you've joined, there is no need to renew — ever. ( Dues are required each time you attend a meeting, though monthly and annual rates are available.) Dues are also required if you attend an open house or any other "non-paid event" on a weekend day. The following paragraph currently does not apply. Members can borrow books from our lending library. LASFS events include Friday night open house and gaming, the Second Sunday social day, seasonal holiday parties, and our annual gift exchange. For a more complete list of LASFS events, visit our calendar . There is something for every SF enthusiast at the LASFS! New LASFS merchandise now available on our Zazzle.com webpage . Check out our New Designs . At the January, 2012 Board meeting, the LASFS' Board of Directors proposed that kids too young to contribute to the work not be allowed on the premises during any work parties at the LASFS. This was Moved, Seconded, and Passed with one abstention. After the meeting is over, some members go out for more conversation over a late dinner or midnight snack. We call this the "aftermeeting". Ask members who are leaving the meeting where they're heading. It's usually Mel's Drive-In, a diner at 14846 Ventura Blvd.